Endometriosis is defined as presence of endometrial tissue in an ectopic site. Endometriosis affects ovaries, Fallopian tube More Detailss, skin, lungs, intestines, surgical scars, lymph nodes, and spine., Involvement of ureter is rare and has been reported most often in a non-functioning kidney. Majority of the patients would require nephrectomy. Often the ureteral involvement with endometriosis is silent and involves left distal ureter. A 26-year-old nulliparous lady presented with a history of intermittent episodes of left lower quadrant abdominal pain for 3 months. Her menstrual cycles were normal. She had no past history of surgical intervention or pelvic infection. About 9 months ago, she had tuberculosis of D3, D5 spine, and successfully completed anti-tuberculous therapy. Her general and pelvic examination was normal. 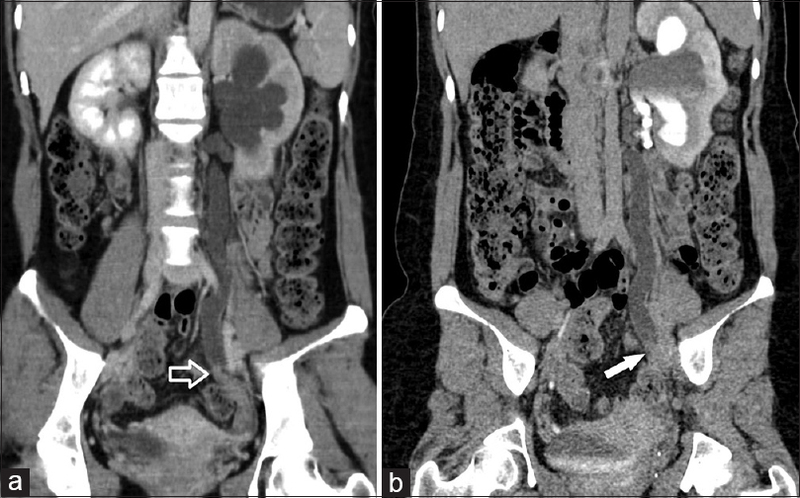 Contrast enhanced computerized tomography (CECT) imaging of the abdomen and pelvis [Figure 1]a and isotope renogram revealed poorly functioning left kidney (split renal function 21%) with hydroureteronephrosis due to left mid-ureteric stricture at S3 vertebra level [Figure 1]b. Tuberculous ureteric stricture was suspected. Left retrograde pyelography (RGP) revealed a passable 1.5 cm stricture in mid-ureter [Figure 2]a. 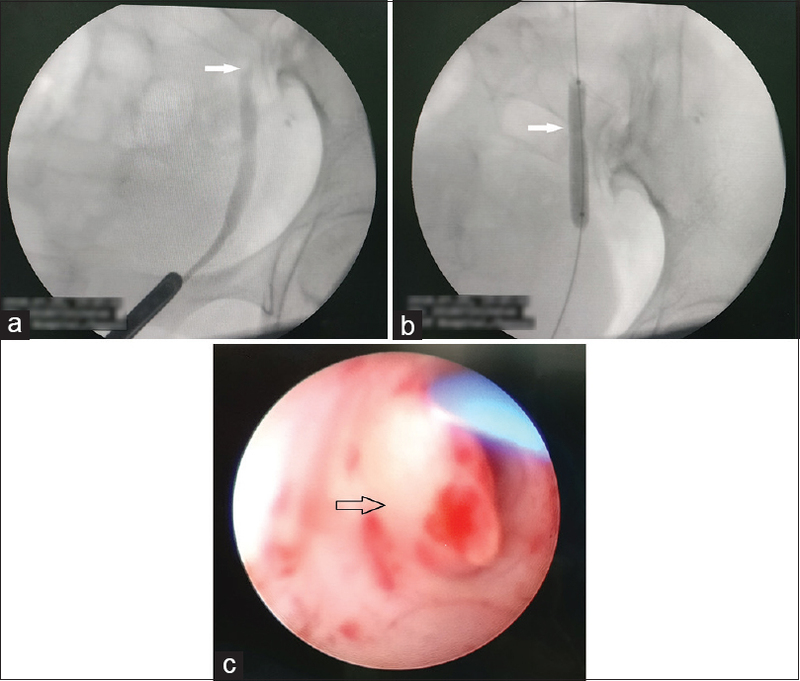 The stricture segment was dilated with a Cook™ ureteroscopic balloon dilator [Figure 2]b followed by ureteroscopy which showed a polypoidal mass of 7 mm in the area of stricture [Figure 2]c. Cold cup biopsy of the lesion was done and a 6 Fr 26 cm silicone DJ stent was placed. 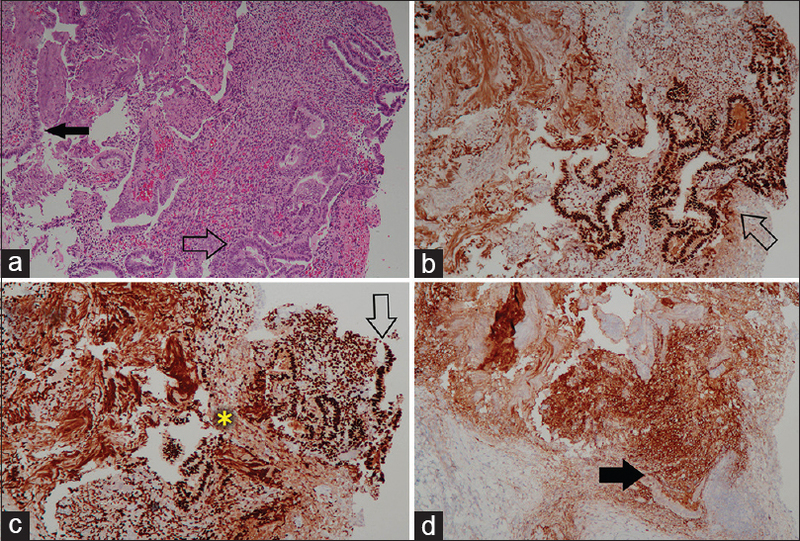 Histopathology of the biopsy revealed endometrial glands with rich vascularity [Figure 3]a. Further immunohistochemical studies with special stains revealed estrogen and progesterone receptor positivity in epithelial layer and CD10 positivity in stromal tissue [Figure 3]b, [Figure 3]c, [Figure 3]d. She was started on oral medroxy progesterone and at follow-up of 6 months, she is doing well. Hematogenous and retrograde lymphatic seeding theory. Differential diagnosis of isolated ureteral endometriosis will include amyloidosis, fibroepithelial polyp, sloughed papilla, and transitional cell carcinoma. Tuberculous strictures involving the ureter are generally multifocal and diffuse, and rarely present as an isolated short segment stricture. CECT urography may be required to rule out extrinsic compression of ureter, while magnetic resonance imaging (MRI) may be beneficial in ruling out pelvic endometriosis. Diagnostic laparoscopy is still the gold standard in pelvic endometriosis. As the conventional imaging is less beneficial in poorly functioning kidney, ureteroscopy with biopsy will be of more value as in our case. Management of ureteric endometriosis includes double J stenting, ureterolysis, ureteric resection, and anastomosis or ureteric reimplantation. Despite all the surgical ureteric intervention, progressive renal dysfunction occurs in 40%. Endometriosis especially in women of childbearing age group should be considered as differential diagnosis in ureteric obstruction as the renal unit can be salvaged by endoscopic intervention at the earlier stage of the disease course. Ludwig M, Bauer O, Wiedemann GJ, Diedrich K. Ureteric and pulmonary endometriosis. Arch Gynecol Obstet 2001;265:158-61. Dongxu Z, Fei Y, Xing X, Bo-Yin Z, Qingsan Z. Low back pain tied to spinal endometriosis. Eur Spine J 2014;23(Suppl 2):214-7. Klein RS, Cattolica EV. Ureteral endometriosis. Urology 1979;13:477-82. Vercellini P, Pisacreta A, Pesole A, Vicentini S, Stellato G. Crosignani PG. Is ureteral endometriosis an asymmetric disease? BJOG 2000;107:559-61. Takeuchi S, Minoura H, Toyoda N, Ichio T, Hirano H, Sugiyama Y. Intrinsic ureteric involvement by endometriosis: A case report. J Obstet Gynaecol Res 1997;23:273-6. Maccagnano C, Pellucchi F, Rocchini L, Ghezzi M, Scattoni V, Montorsi F, et al. Ureteral endometriosis: Proposal for a diagnostic and therapeutic algorithm with a review of the literature. Urol Int 2013;91:1-9. Nisenblat V, Prentice L, Bossuyt PM, Farquhar C, Hull ML, Johnson N. Combination of the non-invasive tests for the diagnosis of endometriosis. Cochrane Database Syst Rev 2016;7:CD012281. Pollack HM, Wills JS. Radiographic features of ureteral endometriosis. AJR Am J Roentgenol 1978;13:627-31.